Schistosomiasis: A Case Series, With Review Of Literature. K Alam, V Maheshwari, A Jain, F Siddiqui, M Haq, S Prasad, A Hasan. Schistosomiasis: A Case Series, With Review Of Literature.. The Internet Journal of Infectious Diseases. 2008 Volume 7 Number 1. Background and Objective: Schistosomiasis is one of the most prevalent parasitic infections in the world, and continues to be a global public health concern in the developing world. The main objective of the article is to study the various clinicopathological features of Chronic schistosomiasis in different anatomical sites; also emphasizing on the need to suspect this parasitic disease even in non-endemic or low-endemicity areas. Material and methods: Ours was a prospective study, conducted at King Faisal Hospital (Taif, Kingdom of Saudi Arabia) from year 2001 to 2005. The study included 32 cases of schistosomiasis involving various organs. Results:32 cases of schistosomiasis affecting various organs were reported. Appendix was the most common organ involved with 16 cases, while ureteric involvement was seen only in 1 case. Urinary bladder involvement was seen in 5 cases while 4 cases affected intestinal tract. Liver, gall bladder and prostate involvement was seen in 2 cases each. All cases were completely cured on treatment with Praziquantel except 2 cases of urinary bladder which developed squamous cell carcinoma. Conclusion: Early diagnosis and treatment of the infection results in complete cure without any complication, and therefore high level of suspicion is required in persons visiting or residing in highly endemic areas. Depending on the parasitic species liver, colon, urinary bladder and ureter are the main organs affected, however any organ can be affected even like lungs, skin, kidney and central nervous system. An expatriate doctor going to work in non-endemic or low-endemicity areas should be aware of the disease and should always be on a look out for an encounter with schistosomal eggs in stool, or in the tissue sections of appendix, urinary bladder, ureter, rectal biopsy etc., because a timely administration of praziquantel can considerably reduce the morbidity associated with the disease. 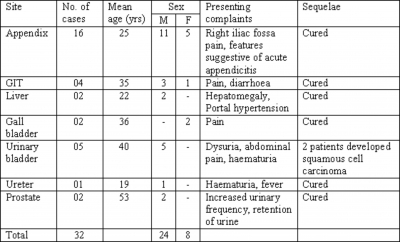 We present a review of 32 cases of Chronic schistosomiasis presenting over a span of 4 years (2001 to 2005) at King Faisal Hospital, Taif, Kingdom of Saudi Arabia. Schistosomiasis was not the suspected initial clinical diagnosis in these cases. These were collected prospectively from the department of surgical pathology. Detailed clinical histories, examination, routine as well as all relevant investigations were obtained later from all the concerned departments. There were 32 cases of Schistosomiasis of various anatomical organs. The clinical presentations of the cases are given in Table 1. Sixteen patients had appendiceal involvement. These patients presented with symptoms of acute appendicitis. Microscopic sections from appendix showed numerous calcified eggs in the wall of appendix, with infiltration of eosinophils and polymorphonuclear leucocytes (Fig.1). 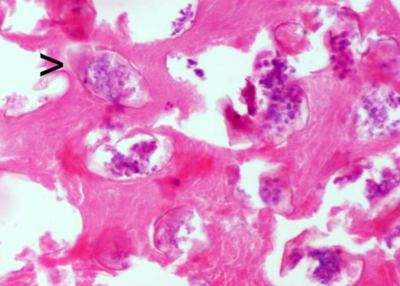 Figure 1: Appendix: numerous calcified eggs of schistosoma seen (H & E x 125). Four patients (3 males and 1female) presented with colicky hypogastric pain / pain in left iliac fossa and diarrhoea. Occult blood in faeces was present in one case, but stool examination was negative for schistosoma eggs. Additional supportive evidence like anaemia and eosinophilia were also observed. 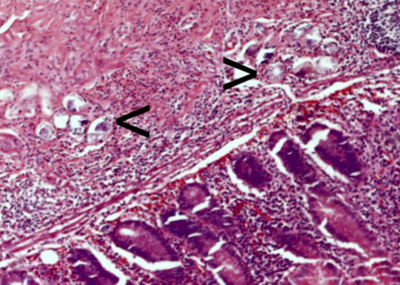 Microscopic examination showed numerous eggs in the submucosal, muscle and serosal layers of the intestine (Fig.2). 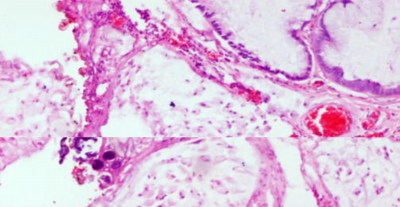 Figure 2: Intestine: schistosomal eggs seen in submucosa (H & E x 500). Hepatic schistosomiasis was found in two cases. The patients presented with hepatosplenomegaly and portal hypertension. Ultrasound examination showed hepatomegaly and portal fibrosis. Microscopic examination revealed round or oval eggs embedded in the parenchyma of liver along with periportal fibrosis. In 2 cases the eggs were surrounded by epithelioid cells and showed foreign body giant cell reaction. There were 2 cases of gall bladder involvement in a 32 and 40 years female. The patients had symptoms of acute cholecystitis along with cholelithiasis. Numerous calcified eggs were seen in the wall. One patient had associated mucous secreting adenocarcinoma of the gall bladder (Fig.3a). Many calcified eggs were seen within the mucin pools (Fig.3b). Figure 3a: Gall bladder: schistosomal eggs seen adjacent to the malignant glands (H & E x 125). Figure 3b: Gall bladder: numerous calcified eggs seen within the mucin pools (H & E x 125). Five patients had involvement of urinary bladder and presented with symptoms like dysuria and abdominal pain. Urine specimen from these patients showed microhematuria, pyuria and eggs of Schistosoma haematobium. 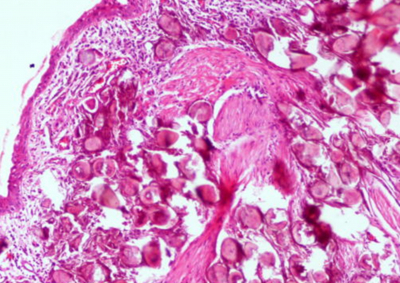 Histopathology showed multiple eggs seen in submucosa and muscle layers (Fig.4). In 2 patients silent foci of squamous cell carcinoma were also present. Figure 4: Urinary bladder: multiple eggs seen in the muscle (H & E x 500). There was one patient with ureteric schistosomiasis. He was a 19 years Saudi male with history of visit to Egypt after which he complained of fever and repeated bouts of hematuria. Ultrasound demonstrated hydronephrosis and ureteral obstruction. 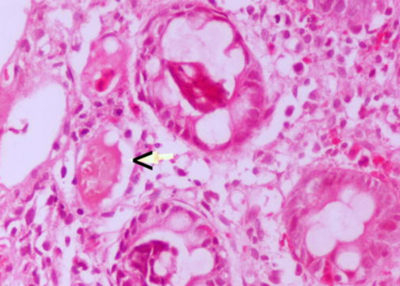 Ureteric biopsy showed numerous deposits of schistosomal eggs almost obliterating the entire wall (Fig.5). Figure 5: Ureter: multiple calcified eggs seen embedded in the submucosa and muscle (H & E x 125). Both the patients with prostatic schistomsomiasis complained of increased frequency and retention of urine. Numerous eggs were seen in the stroma (Fig.6a & Fig.6b). 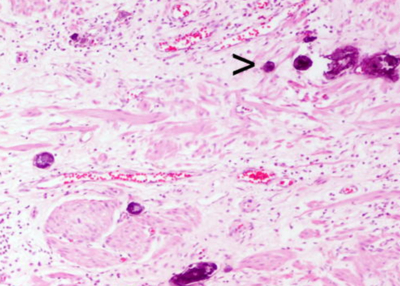 Figure 6a: Prostate: numerous eggs embedded in muscle (H & E x 50). 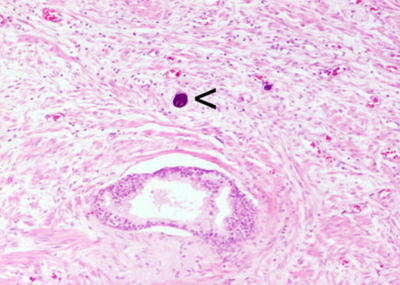 Figure 6b: Prostate: calcified eggs adjacent to mucosal gland (H & E x 125). All the above patients except 2 with squamous cell carcinoma of urinary bladder were treated successfully with praziquantel, and no sign of recurrence or any sequelae of the disease were observed in subsequent check ups. None of our patients presented with polyposis. All our cases were operated for symptoms related to other disorders. Rectal biopsy for suspicion of Schistosoma was not performed in any of our case. Hepatic schistosomiasis occurs predominantly in adolescents who are heavily and repeatedly infected during childhood and is said to be one of the most prevalent cause of portal hypertension in man. 11 Eggs of S. mansoni and S. japonicum embolize to the liver where the granulomatous inflammatory response induces perisinusoidal inflammation and periportal fibrosis known as clay pipe stem fibrosis causing hepatomegaly. 12 In advanced cases there is complete disorganization of hepatic architecture with fibrous enlargement of portal tracts, blood vessels congestion, thrombosis and inflammation but no cirrhosis. 13 This periportal fibrosis which can be visualized on USG, CT or MRI is characteristic of schistosomiasis. 14 Periportal collagen deposits can lead to obstruction in blood flow, portal hypertension and ultimately varices, variceal bleeding, splenomegaly and hypersplenism. 11 Coinfection with either hepatisis B virus (HBV) or hepatitis C virus is associated with accelerated deterioration of hepatic function and increase risk of hepatocellular carcinoma. 15 None of our cases had coexistent viral hepatitis. Schistosomal cholecystitis is a rare entity with few cases described in medical literature. It is unclear whether the eggs trigger acute cholecystitis, since most of the cases have concomitant gallstones, similar to our case. Histopathology reveals extensive fibrocalcific reaction of the walls and ducts resulting in stricture formation of bile causing cholelithiasis. 16 In one of our case with gall bladder adenocarcinoma, schistosomiasis was probably an incidental finding since there is no evidence till date regarding their association. Praziquantel 40 mg /kg bodyweight in a single dose is the treatment of choice. This results in 90% cure rate and considerable reversibility of pathological abnormalities due to schistosome infection. 20 Reexamination of feces or urine one month after treatment is recommended in order to assess efficacy. Vaccines are not yet available. To conclude, one can say that the prevalence of schistosomiasis is changing rapidly; water resource development projects and population movements have led to introduction of schistosomiasis into regions and countries that have not been endemic for the disease. 4 Thus, a high index of suspicion and increased awareness can prompt the clinician and the pathologist to look for the eggs of Schistosoma in surgically resected specimens in persons visiting high endemic areas, enabling early diagnosis and treatment of infection with easily available chemotherapeutic agents. 1. Crompton DWT, Montresor A, Nesheim MC, Savioli L, editors. Controlling disease due to helminth infections. Geneva: World Health Organization; 2003. 2. Patz JA, Graczyk TK, Geller N, Vittor AY. Effects of environmental change on emerging parasitic diseases. Int J Parasitol 2000; 30: 1395-1405. 3. Gryseels B, Polman K, Clerinx J, Kestens L. Human Schistosomiasis. Lancet 2006; 368: 1106-1118. 5. Doumenge JP, Mott KE, Cheung C, Villenave D, Chapuis O, Perrin MF, Reaud-Thomas G, editors. Atlas of the global distribution of Schistosomiasis. Geneva: World Health Organization, 1987. 6. Warren KS. Hepatosplenic schistosomiasis mansoni: an immunologic disease. Bull NY Acad Med 1975; 51: 545-550. 7. Satti MB, Tamimi DM, Sohaibani MA, Quorain AA. Appendicular schistosomiasis. A cause of clinical acute appendicitis. J Clin Pathol 1987; 40: 424-428. 8. Chen MG. Relative distribution of Schistosoma japonicum eggs in the intestine of man, a subject of inconsistency. Acta Trop 1991; 48: 163-171. 9. Hussein AM, Medany S, Abou el Magd AM, Sherif SM, Wilhams CB. Multiple endoscopic polypectomies for schistosomal polyposis of the colon. Lancet 1983; 1: 673-674. 10. Yu XR, Chen PH, Xu JY, Xiao S, Shan ZJ, Zhu SJ. Histological classification of schistosomal egg induced polyps of colon and their clinical significance. An analysis of 272 cases. Chin Med J (Engl) 1991; 104: 64-70. 11. Wirth HP, Casanova C, Meyenberger C, Hammer B, Ammann R, Blum HE. Hepatosplenic schistosomiasis: case report and clinical review. Schweiz Med Wochenschr 1993; 123: 1991-1995. 12. King CL. 2007. Initiation and regulation of disease in Schistosomiasis. In: Mahnoud AAF. eds, Schistosomiasis. London: Imperial College Press; 2007: pp 213-264. 13. Monchy D, Dumurgier C, Heng TK, Hong K, Khun H, Hou SV, Sok KE, Huerre MR. Histology of liver lesions due to Schistosoma mekongi. About six cases with severe portal hypertension operated in Cambodia. Bull Soc Pathol Exot 2006; 99: 359-564. 14. Hatz C, Murakami H, Jenkins JM. A review of the literature on the use of ultrasonography in schistosomiasis with special reference to its use in field studies. 3. Schistosoma japonicum. Acta Trop 1992; 51: 29-36. 15. Aquino RT, Chieffi PP, Catunda SM, Araujo MF, Ribeiro MC, Taddeo EF, Rolim EG. Hepatitis B and C virus markers among patients with hepatosplenic mansonic schistosomiasis. Rev Inst Med Trop Sao Paulo 2000; 42: 313-320. 16. Sharara A, Abisaad G, Haddad M, Mansour A, Tawil A. Acute granulomatous schistosomal cholecystitis. Eur J Gastroenterol Hepatol 2001; 13: 1001-1003. 17. Neal PM. 2004. 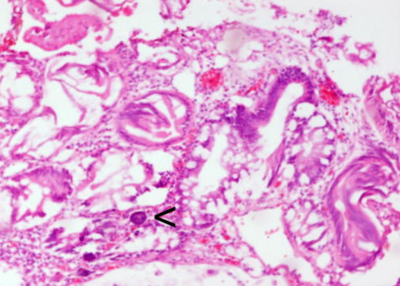 Schistosomiasis-An Unusual cause of Ureteral obstruction: A Case history and perspective. Clin Med Res 2004; 2: 216-227. 18. Bedwani R, Renganathan E, El Kwhsky F, Braga C, Abu Seif HH, Abul Azm T, Zaki A, Franceschi S, Boffetta P. Schistosomiasis and the risk of bladder cancer in Alexandria, Egypt. Br J Cancer 1998; 77: 1186-1189. 19. Lambertucci JR, Voieta I, Barbosa AJA. 2006. Schistosomiasis mansoni of prostate. Rev Soc Bras Med Trop 2006; 39: 233-234. 20. Doehring E. Schistosomiasis in childhood. Eur J Pediatr 1988; 147: 2-9. 21. Wang X, Li S, Zhou Z. A rapid one-step method of EIA for detection of circulating antigen of Schistosoma japonicum. Chin Med J (Engl) 1999; 112: 124-128.